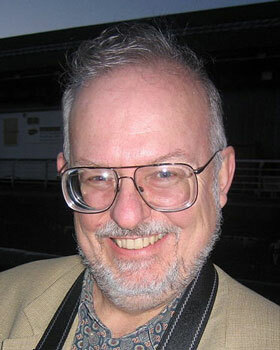 Greg Bear at the World Science Fiction Convention in Glasgow, August 2005. Image © Geoffrey A. Landis. Used by permission. You would be hard pressed to find another science fiction writer as talented as New York Times bestselling author Greg Bear. With each successive novel he releases, his mystique grows. As do his accolades. He has won several Nebula and Hugo awards over the years and has been nominated many times for the World Fantasy, Arthur C. Clarke, and John W. Campbell awards. In 2006, he was the recipient of both the Monty and Heinlein awards. From the release of his first novel, Psychlone (also released under the title Lost Souls ), through such bestsellers as Eon , The Forge of God , Anvil of Stars , Darwin's Radio , and the darkly wonderful Dead Lines , Greg has established himself as one of the best speculative fiction novelists in the world. He's even written a Star Trek: Original Series novel, Corona , and a Star Wars novel, Rogue Planet . His short story collection, The Wind From A Burning Woman , may be one of the best speculative fiction short story collections ever gathered. Greg is also an award-winning artist and founder of the Association of Science Fiction Artists. Greg is a visionary and a futurist as well. In his novels Anvil of Stars and Moving Mars , he envisioned a physics system based on data exchange among self-altering particles. He was the first science fiction writer to depict nanotechnology in fiction. He also was the first writer to present the concept of a quantum logic computer. And after 9/11, Greg was selected by the U.S. Army and the CIA as part of a task force to provide consultation on security issues. He was a member of a group of economists, scientists, novelists, and futurists who performed a threat analysis of various ways that terrorists might attempt to attack the U.S. again. He has also been a consultant for Microsoft Corporation and Sandia National Laboratories and was appointed to the Citizen's Advisory Council on National Space Policy to work in conjunction with NASA. Michael Lohr: So tell me about your bioterror, near-future thriller, Quantico . What was the primary inspiration for the story? Actually, Quantico is more of a science fiction suspense novel. I think you've just invented a new sub-genre. Greg Bear: Quantico is a high tech thriller. John Campbell used to publish very similar stories in Analog back in the fifties and sixties—I'm thinking specifically of Mack Reynolds, Joe Poyer, Rick Raphael. Since that time, the success of Tom Clancy and others has spun this off into a genre of its own—but we shouldn't forget the roots. ML: One of my favorite Greg Bear novels is Dead Lines . What was your inspiration for the story? GB: I love ghost stories—always have. One of my favorite movies is the original The Haunting , and I've been reading Stephen King, Clive Barker, Dean Koontz, and many other writers for decades now. Dead Lines pays homage to some of my favorite stories and writers—M. R. James, H. P. Lovecraft, Richard Matheson, Shirley Jackson. Both Matheson and James Blish incorporated science fictional elements into their speculations about the afterlife—as I did in my novel, Psychlone . For Psychlone , I borrowed a suggestion from Blish's Black Easter —and later saw my scenario—particle beam weapons used against ghosts—wonderfully incorporated into Ghostbusters ! Another favorite. ML: Can a science fiction novel really have influence on modern culture any more? GB: All the time. Beyond Michael Crichton—certainly one of the most popular and influential writers of our time—we find more mainstream writers constantly dipping into science and the future for their themes. Science fiction writers since H. G. Wells have been read by politicians and world leaders, and invited to participate in discussions on the present and the future. That dialog is still going on—I've been invited to numerous government-sponsored seminars and analysis sessions, along with quite a few of my colleagues. ML: I personally think that your first short story collection, The Wind from a Burning Woman , released by Arkham House in 1983, may well be the best collection of science fiction short stories ever gathered—good reading for aspiring speculative fiction writers. GB: While I always enjoy praise for my books, I think everyone should go back and read John Varley's Persistence of Vision and James Tiptree's Ten Thousand Light Years From Home . Now those were important and influential anthologies! ML: You served as a visiting Nat C. Robertson Distinguished Professor in Science & Society at Emory University in Atlanta and taught writing seminars there. Do you enjoy teaching the art of writing? GB: I always like working with students and fellow writers. The Emory visit was delightful—professors and students were both very high caliber, very creative and dedicated. And Emory is also a medical school—which meant I got to talk biology with real experts, always a treat. ML: As a teacher of speculative writing, what is your opinion of the Clarion writers' workshops? Do you feel they have benefit? GB: I've taught at Clarion West several times. The Clarion workshops are excellent places to find out whether you want to launch a career as a writer. The list of professionals who have taken off from these workshops and made fruitful careers is impressive. ML: Have any of your novels been optioned for film rights? GB: There have been a number of options over the years, and as of this writing, The Forge of God is still in play. And there could be even better news soon on another novel. ML: What are your thoughts on the UFO/abduction phenomenon? Though UFOs and all fascinate me, I have never seen anything that could be remotely called a UFO, but my mind is still open. GB: We can't deny the possibility, but I've seen little compelling evidence. The problem with such sightings—along with seeing ghosts—is that these are often intensely subjective experiences, tough to convey to others. The objective proof is certainly lacking, and I've never been fond of vast conspiracies. ML: Have you ever censored yourself? GB: Probably, but my internal guidelines are pretty strict to begin with. I don't want to write immoral fiction—fiction that dishonestly distorts or exploits common experience or human nature. Now, as for honest distortion—honest exploitation—! ML: Have you ever thought about going somewhere else with your writing besides science fiction, such as a western, historical, or mystery novel? GB: Of course! One of my favorite novels is Larry McMurtry's Lonesome Dove , and I have a lot of research material stacked up for a historical or western novel, should I ever decide to write one. So far, however, the fields of SF and fantasy are still pretty rich. ML: I read your article entitled "All the Robots and Isaac Asimov," which is a fascinating essay on the development of robots as mechanisms of fear in popular culture. What do you think about the ASIMO robot developed in Japan to assist the elderly or the very human-looking Repliee Q1Expo android? GB: ASIMO is great fun. The Japanese are doing wonderful work on humanoid or personable robots. The Good Doctor would have been proud—but so far, none of our robots exhibit the capacity to be more than just charming—to actually think, and challenge their masters. ML: So, what exactly is your insight on the Fermi paradox? GB: Long ago, debating the topic with David Brin, I came up with the ecological, predator-prey solution—we don't hear anything out there because smart civilizations believe in keeping quiet, just in case there are predators out hunting. I used this as the basis for the scenario that became The Forge of God . This solution is not very popular with SETI types—I'm not sure why. Perhaps we're still hoping for angels to come down and enlighten us. But I'm pretty sure the rest of the universe functions in much the same way we do here on Earth—and if I had been a Native American, and could have hidden North America, I would certainly have done so. ML: Do you think that nanotechnology and nanites could hold the answer to increasing the longevity of the human species, for example the work at the SENS Institute? GB: As soon as we develop them, I'll let you know! After more than twenty years of nanotechnology in the public eye and in scientific research, the core ideas remain speculative—but we see a lot of nanoparticle "nanotech" solutions in paints, cosmetics, materials science, but no real nanotechnology as K. Eric Drexler envisioned it. These little particles just aren't very smart—certainly not as adaptive as proteins. ML: Did you enjoy writing those Star Trek and Star Wars novels? Are there any more TV or movie tie-in books in your future? GB: I enjoyed both projects, but I don't think I'll be going back to do more. I prefer to create my own universes. ML: What role did you serve on the Citizen's Advisory Council on National Space Policy? Did you determine policy for human civilian space flight? GB: I was proud to work with Jerry Pournelle and Larry Niven and all of their invited experts and fellow writers. The writers helped articulate, clarify, and record the ideas of the experts. CACNSP did some remarkable work over sixteen years, both in space defense proposals and civilian/commercial spaceflight advisories. One of our final tasks was to help NASA smooth the way for private spaceflight, and I think some of those ideas are in place now that a number of entrepreneurs are planning, building, and launching private suborbital spacecraft. ML: What influence has the work of Nikos Kazantzakis and Olaf Stapledon had on your writing? Who's your favorite science fiction novelist to read? And you're not allowed to say Poul Anderson—though we both agree his novels are wonderful reads! For those of you out there that don't know, Greg is married to Poul's daughter, Astrid. GB: Olaf Stapledon absolutely blew me away. I came to Stapledon through reading Sir Arthur Clarke's novels and seeing 2001: A Space Odyssey back in the 1960s. Within a few years, I was in touch with Stapledon experts and enthusiasts like David McClintock and Harvey Satty and Curtis C. Smith, collecting his rarest books and novels—even procuring an autographed copy of A Man Divided from Forrest J. Ackerman. Nikos Kazantzakis came to my attention through the recommendation of Ray Bradbury, and I'm still enjoying his novels and nonfiction—travels and such. I find a number of parallels between these two, with their approaches to the relationship between God, man, and nature: Stapledon, disciplined and incomparably brilliant and a little chilly, Kazantzakis filled with Mediterranean life and splendor, contradictory passions, explosive language. Kazantzakis in some respects is Ray Bradbury's older Greek brother—or perhaps uncle! ML: In Darwin's Children you explored some rather avant-garde, unorthodox theories of early-date colonization of the Americas. Are you fascinated by unorthodox archaeology? GB: The idea that humans could have arrived on this continent earlier than ten thousand years ago is rapidly becoming accepted doctrine. No way would I have made my Homo erectus pioneers of twenty thousand years ago be less than a meter tall, however—that would have been silly! And yet the Homo floresiensis specimens from Indonesia are likely Homo erectus , twenty thousand or fewer years old, and just three feet in height when mature. ML: What projects are you currently working on and what will we see next from Greg Bear? GB: Quantico is being published in paperback soon by Vanguard/Perseus with a major push—the hardcover had a larger first printing (by nearly double!) than any of my previous books, and at the moment is my best-selling hardcover ever. Plus, in combination with some other events, Quantico landed me on The Daily Show with Jon Stewart , which was great fun. I've finished and handed in the longest and most ambitious science fiction novel I've written in years, City at the End of Time . It pays homage to many of my favorite writers, including William Hope Hodgson, Olaf Stapledon, and Sir Arthur Clarke. It's set one hundred trillion years in the future—and in contemporary Seattle. ML: With all the imaginative bits of technology and whatnot that you've essentially invented in your novels, do you own any patents, like Arthur C. Clarke? Have you pursued any of your ideas as inventions? GB: No patents. Compared to defending patents and inventions, writing is easy! ML: What science fiction novel has had the greatest impact on society? GB: I'd say Frankenstein , closely followed by 1984 , Brave New World , and today, quite possibly Fahrenheit 451 . But books that influence us all should not eclipse books which transform certain classes, endeavors, or philosophiesit's almost impossible to judge the depth of influence of writers like Asimov and Clarke, Heinlein and Anderson. None of the first three books I mention above ( Fahrenheit 451 being the exception) were that influential on me, for example—as brilliant as they are—whereas much more obscure writers and works knocked my socks off. It's all about age, preparation, anticipation. The oddest little books can turn us topsy-turvy. To learn more about Greg, please go to his official website: http://www.gregbear.com. Michael Lohr is a writer/journalist and university researcher. He is a Fellow with the Mudlark Society of the British Museum in London. He is also a world explorer and belongs to many adventuring groups including the World Explorer's Club, Global Research and Discovery Network, The Explorer's Club, National Geographic Society, and the World Mountain Institute. His website is http://www.internet.is/artist/writer/michael_lohr.htm.